at the Tampa/St. 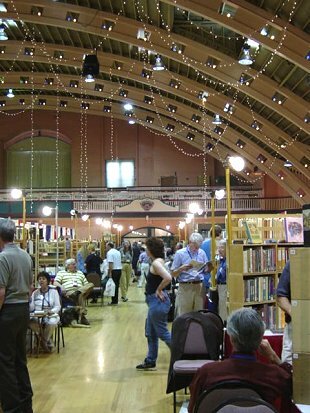 Petersburg, FL Antiquarian Book Fair March 14, 15, & 16, 2003 for a total of 2230, 174 more than the 2002 Fair and the second highest on record, reports Larry Kellogg, fair manager. I was at the show as a seller this year, my second time as a dealer but 4th or 5th time attending the show. I like the show from both perspectives: it is extremely easy to set up a booth as a dealer and the facility is a beautiful building so attendees have a lovely and comfortable setting in which to spend time shopping. 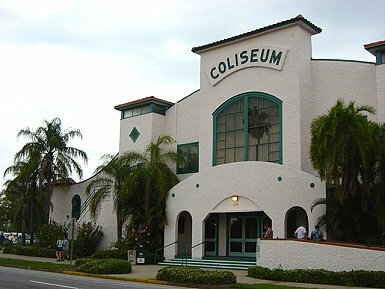 The Coliseum is the place where the dance sequence for the movie Cocoon was filmed. With wood floors, a balcony and stage, and lots of twinkle lights hanging down from the domed ceiling, the setting is much less austere than the shows which are held in big warehouse-like buildings. This was the 8th year in this location and the 22nd annual fair. The “St. 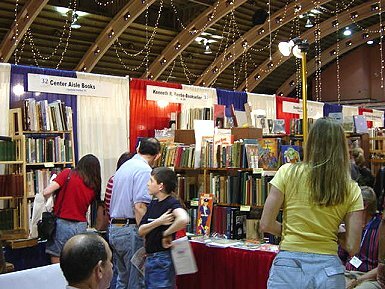 Pete” book fair had 116 dealers from 26 states and countries (including Canada and Germany) so the international flavor has been maintained over the years. Sponsored by FABA (Florida Antiquarian Booksellers Association), the show has had a waiting list for many of those years (I don’t know the early history of the show). This year there were 22 new dealers who were selected from the waiting list of 70. If there is a last minute cancellation, Larry calls numbers down the waiting list and the first person who agrees to come gets the booth – he doesn’t have the time to wait for callbacks – his job is to make sure that the booths are rented and he is relentless in getting the job done! There is a formula for the total number of FL dealers, FABA Dealers and out-of-state dealers and placement on the list to keep the show interesting to a wide variety of collectors. The most expensive book I saw FS was Hemingway’s first book: Three Stories and Ten Poems offered for $65,000 by Between The Covers, ABAA, Merchantville, N.J. Tom Congalton, owner. I have a ‘worst’ category but I’ll let it go. I’d like to highlight a unique dealer at the show: Costin Graphics had only one book for sale. And it hasn’t been finished as of yet (actually it is not bound so isn’t really a book). And I purchased one page of it 2 years ago and it has already appreciated almost 50%! Let me explain: John Costin Graphics is selling Florida Birds engravings by subscription like artists did years ago. A clamshell elephant portfolio case holds the steel engravings of Florida Birds that are, of course, hand colored and they are beautiful. There will be 250 engravings (plus 25 artist proofs). 150 books sold as a part of the subscription series and 100 of each of the 20 birds will be sold separately. I purchased the Wood Stork in 2001 and it is one of my most cherished possessions. Artist John Costin took the time to describe the process he uses in detail but I think that his web site (http:/www.costingraphics.com ) describes it much better than I can. I can just report that he and his wife, Janet, are two of the nicest artists I’ve ever met and I wish them much success. Many of the Florida museums and universities are purchasing this series so if you are interested in owning the entire series or individual issues, please contact them (caracara@tampabay.rr.com ) or 813-248-5088. Another interesting dealer was Haslam Marbled Papers. Debbie Haslam was demonstrating how to make paper and selling individual sheets of the finished product. You could ask for specific colors and watch it being made or just select from various colors and sizes already to wrap. This paper can be used by book binders or crafters. Both booths added a nice touch to the show. There was also an insurance company at a booth handing out information on the cost of insurance book collections and a table of handouts. Not present this year were Alibris and ABE, both prior exhibitors. Attendance aside, how were sales with the war looming at any moment? Well, the best response I received when I asked a number of dealers the question was from John Berryman: “The Fair far exceeded my lowered expectations!”. Can a response be any more oblique? John (Sandy & John Berryman Fine Books, Orman Beach, FL) is a long time fair dealer and I’m guessing he has answered this question more than once! Over the years I’ve heard dealers complain about sales, brag about sales and hedge about reporting exact sales but this response has to be the best I’ve heard yet. Personally, my sales were down 20% from the last time I did the show (March, 2001) and as I don’t take much stock in the accuracy of the reports of sales via dealer questionnaire responses, I’m reporting that some dealers did well, some didn’t do as well as other years and some just wouldn’t say! If you have an interest in visiting or showing at The Tampa/St. Pete Book Fair, contact Larry Kellogg at flapr@tampabay.rr.com for further details (or call 727-822-3278). Next year’s show will be March 12-14th starting at 5:30 PM on Friday night. Saturday hours are 10 am to 5pm and Sunday hours are 11am to 4pm. The $6.00 ticket is good for all three days but is not refundable if the weather isn’t at least in the 70s! Attending the Florida fair is a very good way to get a jump-start on spring because chances are very good that the weather won’t disappoint you.